Earthy and spicy and unlike anything else, ginger is an unbeatable cocktail ingredient. But in its raw form, knobby and fibrous, it's not the easiest to work with. Our recommendation for the cocktail-loving gingerphile? Pick up a bottle of the King's Ginger. Made in Holland, this "emphatically ginger liqueur" was first created in 1903, so the story goes, at the behest of King Edward VII. Within the last few years, it's come into fashion on this side of the Atlantic. And it's easy to see why. It's got a vibrant, true ginger character—not the bare hint of ginger flavor you might find in other liqueurs. Nor does it have their cloying, overpowering sweetness, so you can dial up the ginger without overwhelming a drink with sugar. And since it clocks in at a full 80 proof, the same as your average vodka, or gin, or tequila, the King's Ginger can star as your central spirit—though it plays nicely with others, too. In short? 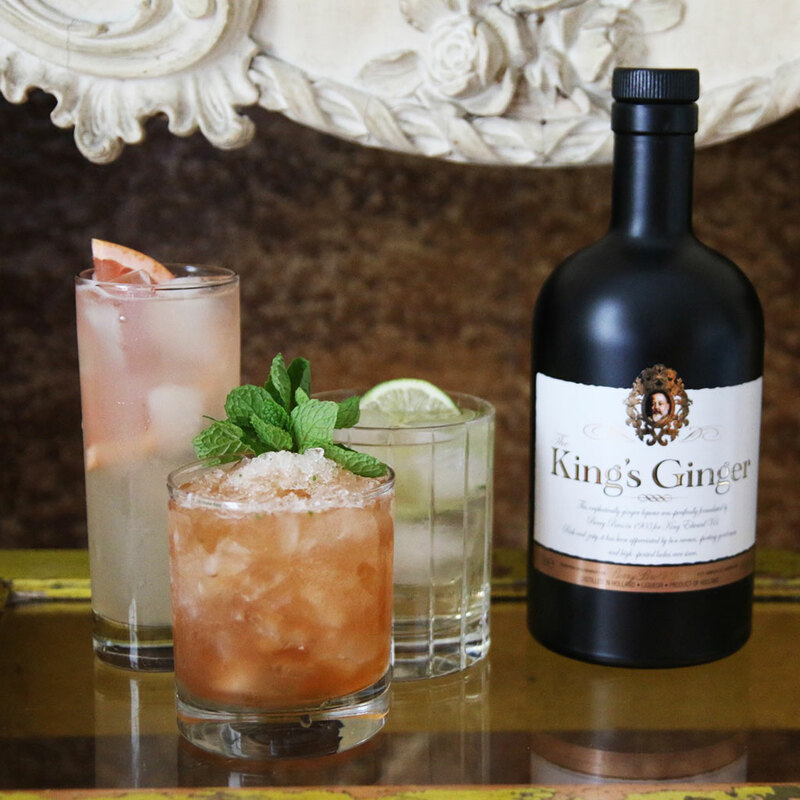 King's Ginger is an ideal pick for making cocktails at home. Here are three of our favorites, from dead-simple to slightly more advanced—but none require other fancy ingredients. A few bottles of standard spirits are all you need. This drink is so straightforward, we feel a little guilty calling it a cocktail. But it's a tribute to the King's Ginger that it barely needs dressing up. On first sip, it's hard to believe that this cocktail only has two ingredients (three, if you count the garnish). Instructions: Pour an ounce and a half of King's Ginger over ice. Add four ounces of soda. A lime wedge or wheel makes a nice garnish. Boom, you made a cocktail. Ever had a Paloma? If not, we're pleased to make the introduction; this Mexican favorite combines tequila and grapefruit soda for a super-refreshing cocktail. In our version, King's Ginger blends beautifully with grapefruit and lime, and proves a great match for tequila's bite. Instructions: Start with fresh juices, a half an ounce of lime and a full ounce of grapefruit per cocktail. Pour those in a cocktail shaker with lots of ice, 3/4 ounce of the King's Ginger, and a full ounce of silver tequila; Don Julio's smooth, easy-drinking silver works great here. Add a dash of orange bitters if you have 'em. Shake all that up and strain into a tall glass over fresh ice. Top it all off with soda to fill, about two ounces. Try not to drink all at once. Rye whiskey and ginger both have a distinct spiciness, which is why they're so great together in this boozy shaken cocktail. If you like mint juleps, this is the drink for you. It's a little more time-intensive, but still requires nothing much beyond King's Ginger and one other bottle. Fair warning: the interesting, varied flavors of this drink can have you forgetting it's basically all booze. Instructions: In a cocktail shaker with ice, pour an ounce of King's Ginger and an ounce of rye—we love Rendezvous Rye from High West Distillery. Drop 10 mint leaves in there. A dash of Angostura bitters, too, if you've got it. Shake it all up, and strain over fresh ice. (Little bits of mint will still be in there. It's a good look that way.) Regular ice is fine, but for a real showstopper, use the crushed stuff—fill a bag with ice, get out your aggressions by whacking it with a heavy object, and there you go. Garnish with a few mint sprigs gathered together—and for maximum mint flavor, gently smack 'em against your hand a few times before you arrange in the drink. That'll release some of the mint oils and make the minty aroma really sing.